Duluth Mayor Emily Larson speaks at the PA event. St. Scholastica celebrated the start of its Physician Assistant program during an event May 5 in its new Health Science Center at 940 Woodland Ave.
College leaders officially announced that the Accreditation Review Commission on Education for the Physician Assistant (ARC-PA) has granted Accreditation - Provisional status to St. Scholastica's PA program. Duluth Mayor Emily Larson was among the dignitaries speaking at the brief program. 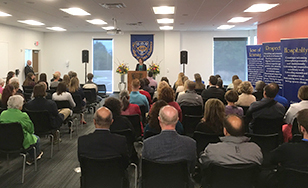 Leaders of the region's health care and educational institutions, as well as faculty, staff and students attended the event. The first class of students in St. Scholastica's PA program will begin their studies in September. Students who complete the two-year program will receive a master's degree in PA Studies. St. Scholastica's program was developed through collaboration with healthcare providers across the region to meet a growing need for care providers. As healthcare costs rise and the number of physicians declines, the demand for non-physician healthcare providers has boomed. Graduates of St. Scholastica's new program are expected to fill this acute need, particularly in rural communities, where physicians are especially scarce. According to the Bureau of Labor Statistics, employment for PAs is expected to increase by 30 percent nationwide by 2024. The majority of graduates from this program are expected to practice in the five-state region, primarily in Minnesota and Wisconsin and in underserved urban or rural settings where the need for trained professionals is greatest. The innovative curriculum uses high-tech classrooms and medical simulation software. This is the only PA program north of the Twin Cities.